Definition at line 338 of file util.c. Referenced by delegation_create(), format_abs_path(), handle_open(), nfs41_lookup(), open_state_rename(), prev_non_delimiter(), and referral_resolve(). Definition at line 380 of file util.c. Definition at line 354 of file util.c. Referenced by copy_fh(), delegation_create(), get_path_fhs(), layout_state_create(), name_cache_entry_update(), path_fh_copy(), prev_non_delimiter(), and server_lookup_loop(). Definition at line 204 of file util.c. Definition at line 55 of file util.c. Referenced by __release_category(), FT_DEFINE_SERVICE(), ft_property_do(), gen_proxy(), gen_stub(), gen_stub_thunk(), parse_close(), parse_getexattr(), parse_mount(), parse_open(), parse_readdir(), parse_setattr(), parse_setexattr(), parse_symlink(), pointer_tests(), write_client_func_decl(), write_dispatchtable(), write_function_stub(), write_proxy_methods(), write_proxy_procformatstring_offsets(), write_routinetable(), write_stub_methods(), and write_thunk_methods(). Definition at line 210 of file util.c. Referenced by delegation_truncate(), and settime_how(). Definition at line 330 of file util.c. Referenced by get_path_fhs(), name_cache_lookup(), prev_non_delimiter(), and server_lookup_loop(). Definition at line 317 of file util.c. Referenced by abs_path_link(), create_open_state(), create_silly_rename(), delegation_create(), lookup_symlink(), map_lookup_error(), nfs41_lookup(), nfs41_symlink_follow(), open_state_rename(), path_fh_init(), prev_non_delimiter(), and server_lookup(). Definition at line 293 of file util.c. Referenced by handle_open(), and handle_symlink(). Referenced by file_layout_read_thread(), and read_from_mds(). Definition at line 92 of file util.c. Referenced by file_layout_write_thread(), and write_to_mds(). Definition at line 218 of file util.c. Referenced by cl_addr_compare(), and server_addrs_add(). Definition at line 305 of file util.c. Referenced by abs_path_link(), get_component_array(), get_path_fhs(), name_cache_lookup(), and prev_non_delimiter(). Definition at line 137 of file util.c. 158 // FILE_ATTRIBUTE_NORMAL attribute is only set if no other attributes are present. 159 // all other override this value. Referenced by handle_getattr(), nfs_to_basic_info(), nfs_to_network_openinfo(), nfs_to_standard_info(), and readdir_copy_dir_info(). Definition at line 163 of file util.c. Referenced by handle_getattr(), and handle_open(). Definition at line 189 of file util.c. Definition at line 175 of file util.c. 185 std_out->Directory = FileAttributes & FILE_ATTRIBUTE_DIRECTORY ? Definition at line 235 of file util.c. 239 eprintf("nfs_to_windows_error called with non-nfs "
286 dprintf(1, "nfs error %s not mapped to windows error; "
Referenced by cancel_lock(), cancel_open(), do_nfs41_close(), get_volume_size_info(), handle_close(), handle_lock(), handle_nfs41_remove(), handle_nfs41_set_size(), handle_open(), handle_readdir(), handle_setacl(), handle_setexattr(), handle_unlock(), map_lookup_error(), map_symlink_errors(), nfs41_cached_getattr(), nfs41_name_cache_remove_stale(), read_from_mds(), referral_resolve(), session_get_lease(), and write_to_mds(). Definition at line 364 of file util.c. Referenced by nfs41_lookup(), prev_non_delimiter(), and server_lookup(). Definition at line 346 of file util.c. Referenced by create_open_state(), delegation_create(), and prev_non_delimiter(). Definition at line 33 of file util.c. Referenced by get_name(), handle_unlock(), parse_abs_path(), parse_close(), parse_getacl(), parse_getattr(), parse_getexattr(), parse_lock(), parse_mount(), parse_open(), parse_readdir(), parse_rw(), parse_setacl(), parse_setattr(), parse_setexattr(), parse_symlink(), parse_unlock(), parse_volume(), and upcall_parse(). Definition at line 44 of file util.c. 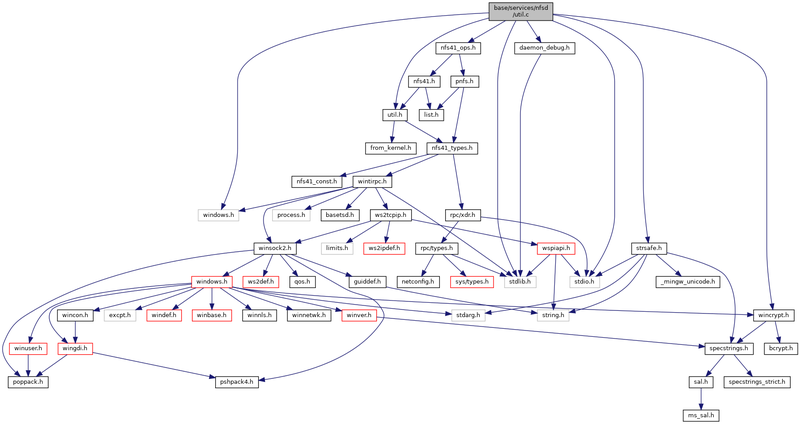 Referenced by delegation_return(), marshall_getacl(), marshall_getattr(), marshall_getexattr(), marshall_mount(), marshall_open(), marshall_readdir(), marshall_rw(), marshall_setacl(), marshall_setattr(), marshall_setexattr(), marshall_symlink(), marshall_volume(), and upcall_marshall(). Definition at line 73 of file util.c. Definition at line 126 of file util.c. Definition at line 100 of file util.c.